Last Updated: March 19, 2014 By Katie 32 Comments -- Paid Promotion. Disclosure policy here. I’ve been listening to Lana Del Rey Pandora and I can’t stop. It’s all just so good. It makes me want summer and the beach and cruising down the 101 with the windows down and it makes me want to wear flowers in my hair and run through a field and just to go go go and not think about what I’m doing or care for that matter. And it makes me feel free. And I like that. It’s a good feeling. It feels like summer. Summer in March- I’ll take it. 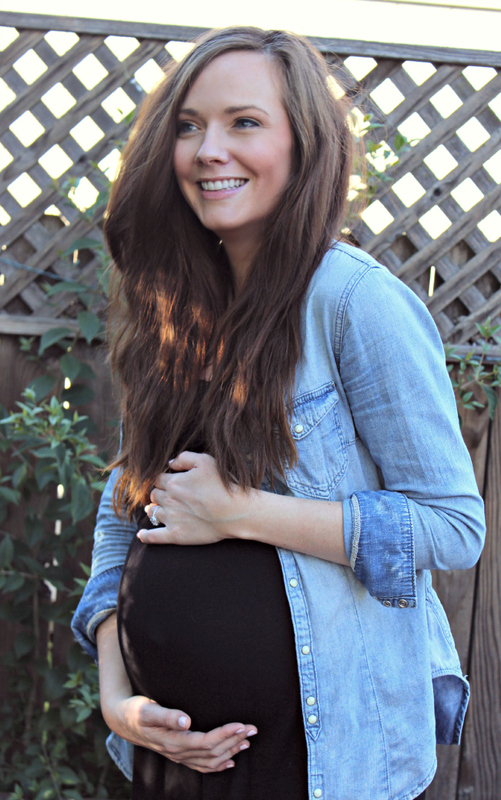 You are seriously one of the most gorgeous pregnant women ever! Aww you are so sweet!! :) Thank Pamela! You are such a cutie pie, Katie! You always look so perfect! And I’m so jealous. I want summer weather so bad. Clearly, I’m just going to have to move to California. YES, move to CA. :) That is the obvious solution. Seriously? So cute. 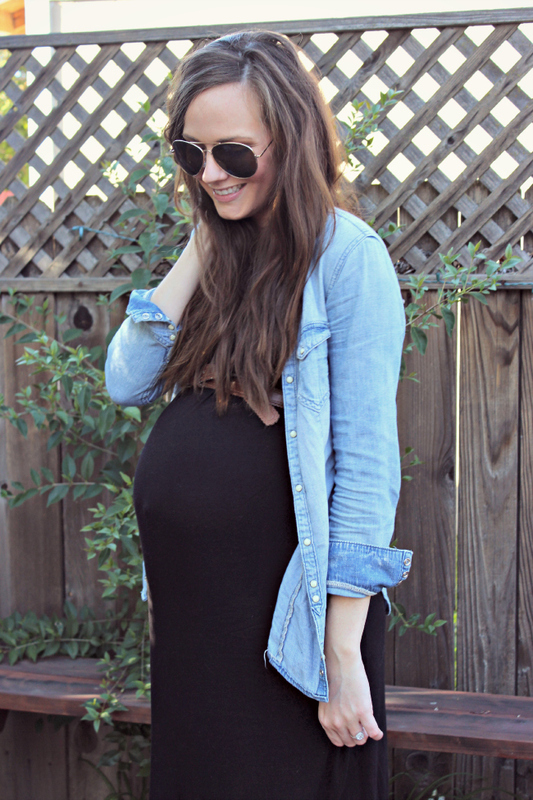 I LOVE the pregnant fashion posts especially cause I feel like there’s hope for being stylish and pregnant! OMG i seriously can’t get over your belly it’s so freaking cute ^_^ I absolutely love love love that you are still getting dressed and doing your hair and makeup even when being pregnant. I know it’s hard for a lot of women because let’s be real there are probably days where you’re like naaaaa ain’t happening lol. I give you major props girl!!! Aw thanks lady!! :) And girl, it’s kind of my saving grace, especially on days I’m feeling SUPER pregnant- doing my makeup and getting myself ready makes me FEEL better! And working out, of course. Ahhh, you are adorable! 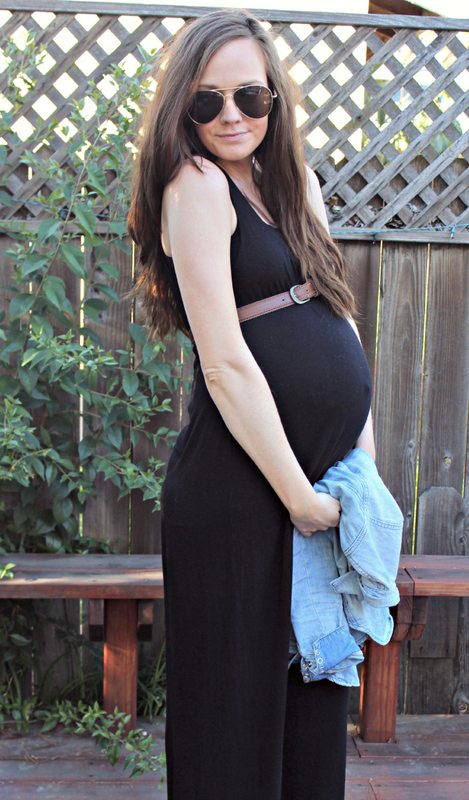 This maxi is so cute on you and I love how you belted it. 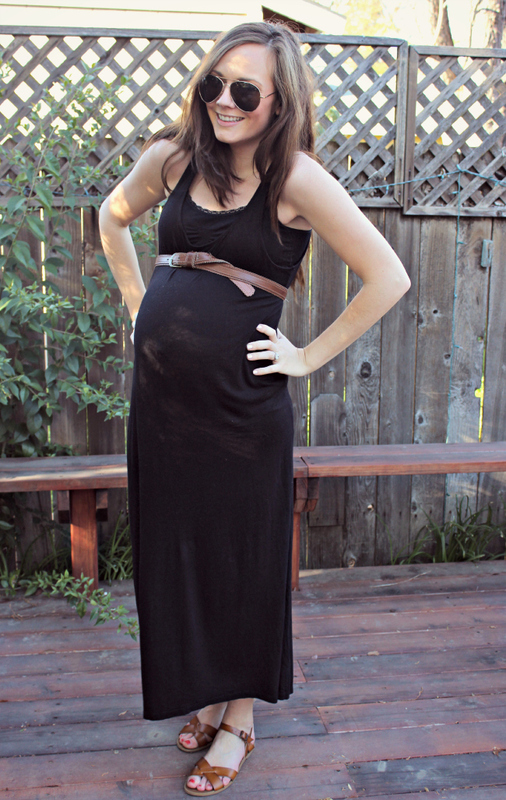 More adorable pregnant woman ever. Awww you’re the sweetest!!! :) And amen amen amen to summer days! 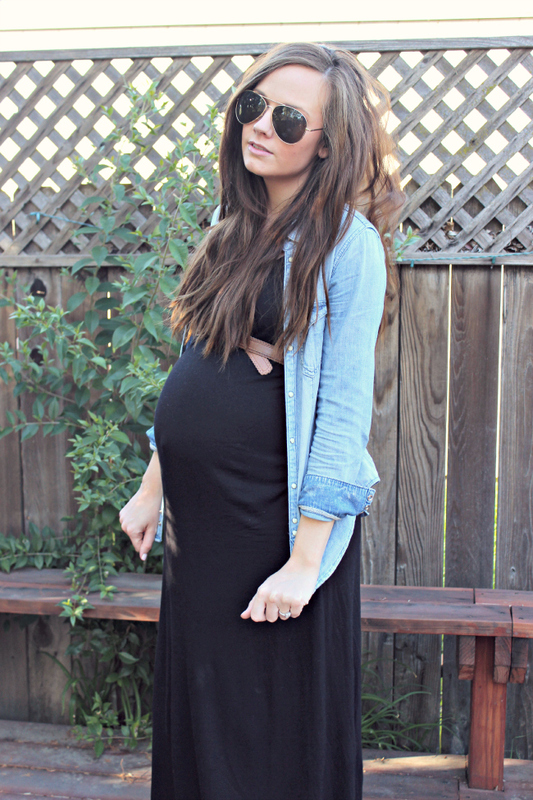 By far the cutest maternity wardrobe! Love it! Oh gosh, you have the best wardrobe ever! I swearrrrrr. I’m obsessed with everything that you wear! Katie!!! So BEAUTIFUL!! Still cannot believe you will be blessed soon with a perfectly cute baby!! :) And LOVE Lana Del Rey as well!! Make me all giddy of sorts! :) xoxo!! Confession….I saved your first picture in my “one day” photo album because I basically want to look just like this when I’m pregnant some day. I love the look! Hi baby!! You are coming so soon! Yes I love those warm March days! Saturday was one for us here and now the weather is threatening snow tomorrow…what?! Could you stop? I mean you are the cutest pregnant woman EVER. 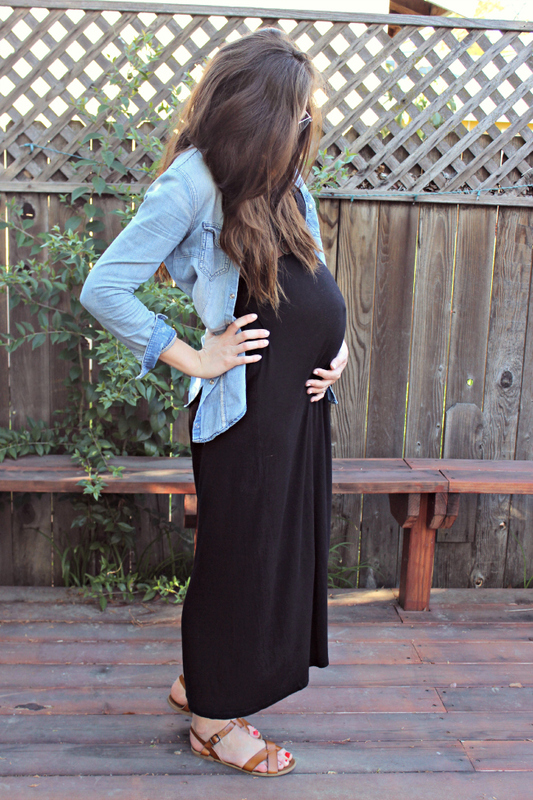 Seriously you’re adorable and I’m loving the black maxi. I’m also jealous of your warm days. 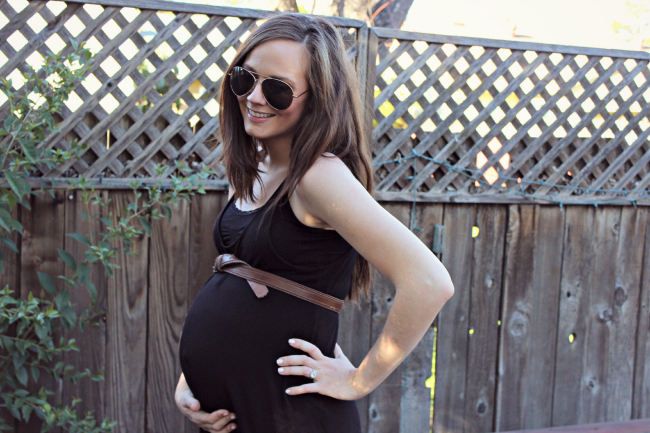 Gorgeous maternity style! Love how you tied the belt! love everything about this post! and your baby bump is getting so big!